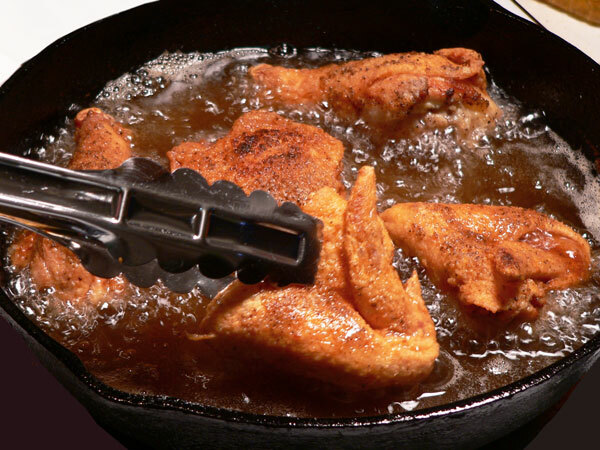 Follow step-by-step, photo illustrated instructions for making our Southern Fried Chicken in a cast iron skillet, just like mama used to do it. I’ll even share our families secret recipe of “herbs and spices,” so you can make this delicious old southern classic at home for you and your family to enjoy. Printable recipe included. 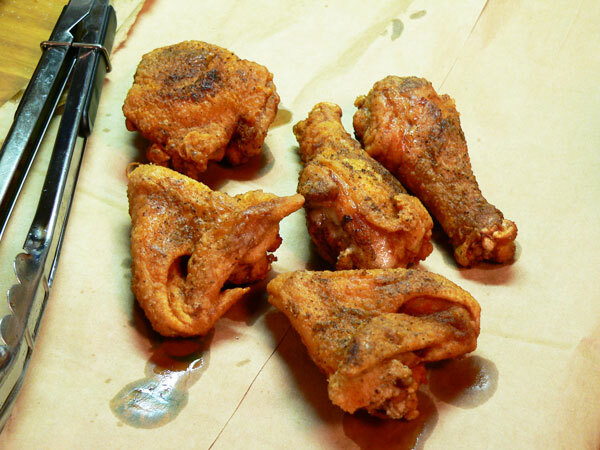 I’ve been asked numerous times over the past years, for a recipe on Southern Fried Chicken. I think I’ve just been putting it off, because I must be honest, I can’t fry chicken the way my mother did. Yes, I’ve tried, but it just never seems to be what I remember eating sitting at her table. As I’ve mentioned before, we always had 11-15 people at our house for Sunday Dinner, each and every Sunday. My older brother and sister had married and had children of their own, years before I ever did. Mama always expected ALL of us to be at her house on Sunday. And, if that wasn’t enough, 9 times out of 10, she invited the pastor and his family. But, all was well and good. She always had plenty of food. Mama would get up early on Sunday and start cooking, before she got ready for church. What she didn’t finish by church time, she finished just as soon as she got home, and could get more comfortable shoes and her apron on. She always had the apron. Sometimes chicken would be frying away and she’d just cut the burner off, cover the pan, and go to church. When she got back, she’d turn the burner back on and continue right where she left off. Of course, back then, once everyone ate, Mama would just throw a big white cloth over the table after all the dirty dishes were removed. The remaining food would sit right on the table, chicken and all, until supper time when we’d dig into it again. Ahhh, those were the days. I totally LOVED Mama’s fried chicken. Always a drumstick or thigh, seldom the breast part. Or, maybe I’d get lucky and find the wishbone. You know, I still can’t cut up a chicken to where it has a wishbone. I’m not very adept at carving up a whole chicken anyway. I get by, but that’s about it. Mama fried chicken in her cast iron skillet during the week, but Sundays required the bigger, Electric Frying Pan that she acquired later on. Just so you’ll know, the skillet you’ll see pictured below IS the exact same skillet. It’s my most treasured piece of cooking equipment. I’ve often wondered why I can’t seem to fry chicken up the same way she did. She always used Lard. I use Lard. 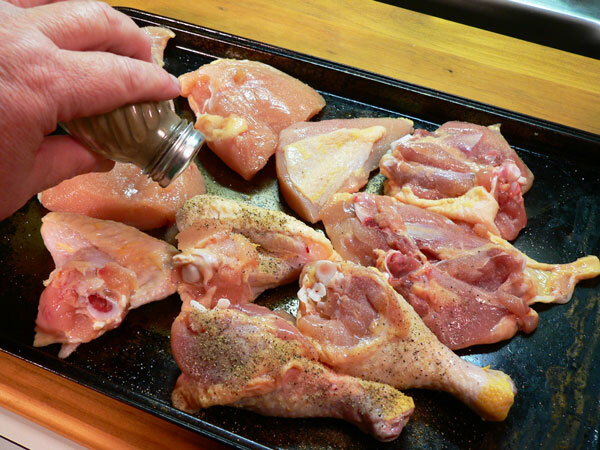 As for that family secret of “herbs and spices,” Mama only used TWO… Salt and Black Pepper. Tell that to the Colonel. Still, her chicken came out fabulously. And, it wasn’t just me, most everyone else raved about how good it was. I’ve read that the reason chicken doesn’t taste like it use to, is because of the way chickens are raised these days. It appears the best way to even get close to the chicken of days gone by, is to buy organic and farm raised chickens. I’m going to do that one day just to see if it makes a difference. I’m just too quick to grab one at the big mart when I’m ready to fry up my own. I will however, do my best to show you the process. It’s the way Mama cooked hers, and the way I cook it myself, minus her special touch of course. I hope you’ll try it in a big old cast iron skillet of your own, and come back and let me know how you like it. Ready to give it a try? Alright then, heat up some Lard and Let’s Get Cooking! Skillet Fried Chicken: You’ll need these ingredients. I realized after I placed the pictures from the camera onto my computer, that the bucket of Lard wasn’t saying LARD but Manteca. But, that was a good thing, because if you can’t find Lard in your grocery store, check one of the Hispanic stores. Chances are they will have it under the name of Manteca. One side of this bucket says Lard, the other says Manteca… same thing. I realize we could get into lots of discussion over using Lard, but let’s just enjoy the memories… OK? Most whole chickens come packed with a packet of giblets inside the chicken cavity. The neck bone will either be still attached, or also inside the bird. You’ll want to be sure to remove the packet of giblets and save them for later. 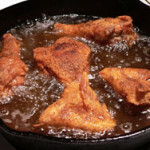 You can use them to make gravy for your fried chicken, or freeze them for later, maybe to make your own chicken stock. Give the bird a good bath, inside and out. Rinse it under cold running water inside the sink. Cut up the chicken. Now, that’s a whole step-by-step story within itself that we’ll save for another day. Maybe after I get a bit better at it myself. Just saying. Be sure to save the back, neck and giblet pieces. We can use those in another recipe later. It will make great stock or soup, so freeze it all together if you don’t have plans to use it within a day or so. 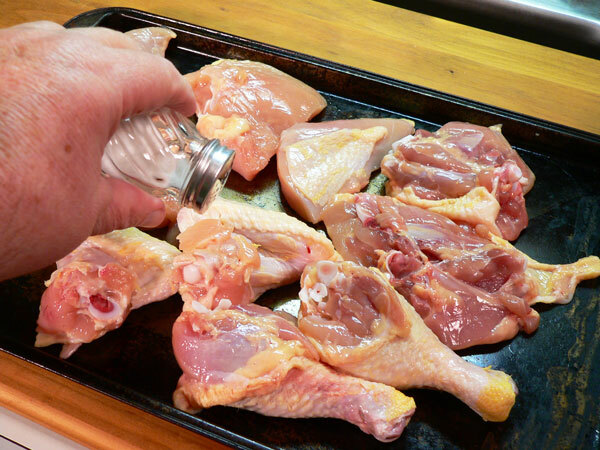 Lay the chicken out on a sheet pan and add just a little bit of salt to taste. Give it some Black Pepper, also to taste. Basically whatever you think you can get away with for your family. Turn all the pieces over, right there in the pan, and season the other side with Salt and Black Pepper. 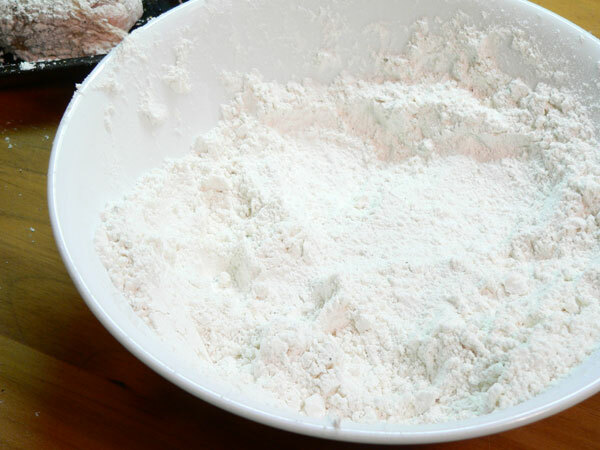 Place about 2 cups of flour in a medium size bowl. Use a fork to break up any large lumps that might be in it. 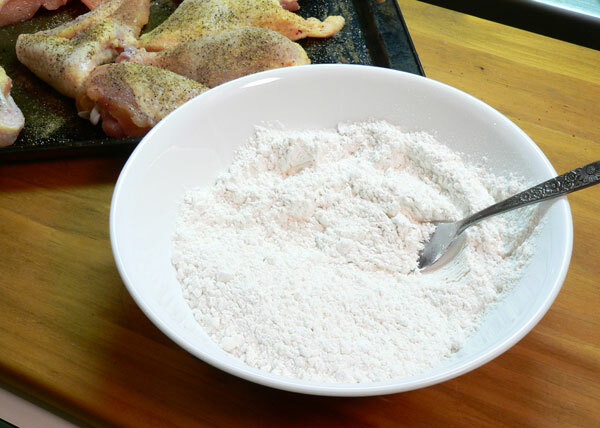 One piece at a time, dredge the chicken in the flour. Just drop a piece in, turn it over a time or two, and coat all the sides and edges. Gently shake off any excess flour. 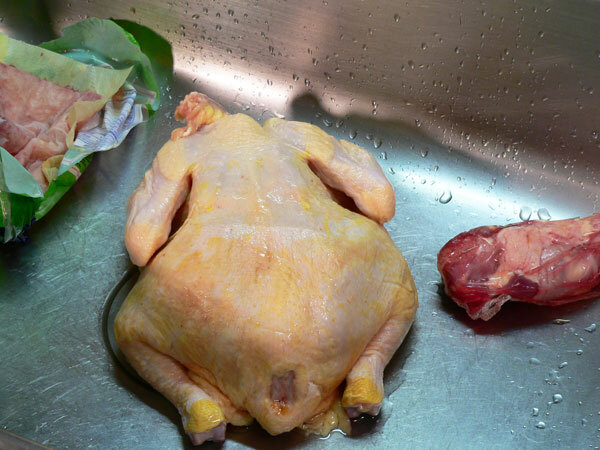 If you have a piece of chicken where the skin has pulled loose from the meat, just fold it back down on the meat. Don’t try to flour underneath the skin. The flour will not brown once it’s in the hot oil, and you aren’t really going to like the outcome. You can thank me later. 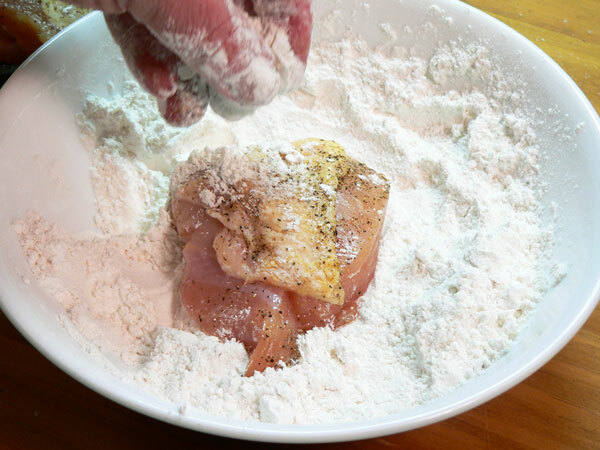 Just spread the loose skin back out on the chicken piece and coat the top with flour. Continue this with each piece, placing it back on the sheet pan after shaking off any excess flour. Discard any leftover flour. I know it seems wasteful, but it’s better to toss it than cross contaminate some other food later. Once you’ve coated all the chicken pieces, just let it set on the sheet pan and rest a bit. This will allow the coating to dry and hold to the chicken better. We’ll just let it sit out for the length of time it takes to heat up the cooking oil. You could also place it, uncovered, in the refrigerator for an hour or two, until you’re ready to fry it up. 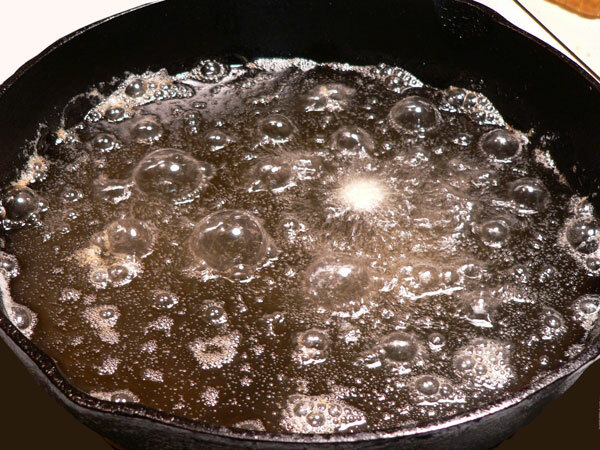 Place some lard in your cast iron skillet. 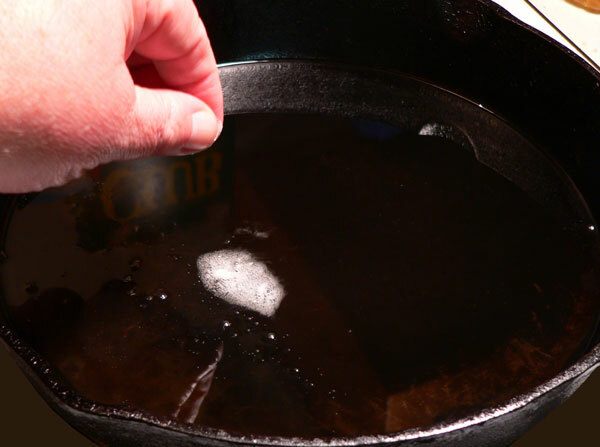 You’ll need enough lard, once it’s melted, to measure about 3/4 of an inch deep inside the skillet. 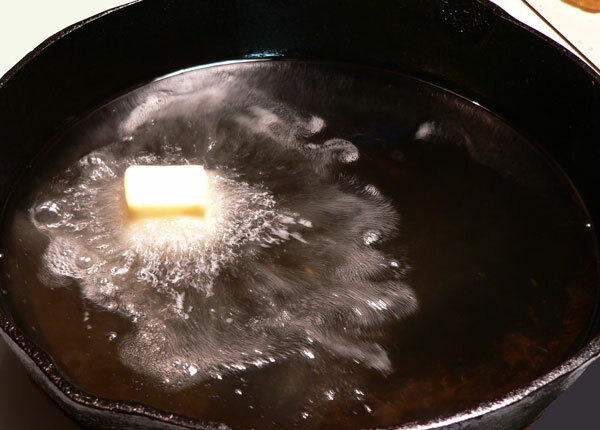 Once the lard has melted and started to warm up, CAREFULLY add the Butter. A Tablespoon full of Bacon Grease would also be really good, if you have that. The butter will of course brown in the Lard but that’s the point. It helps give the first pieces of chicken cooked in the Lard a nice brown color. It also helps to add some flavor. I say carefully, because the cold Butter going into the hot Lard, will start to bubble and splatter. Just be sure you don’t let it splatter out on yourself. A splatter screen comes in pretty handy for frying chicken. One day, I think I’ll actually buy myself one. Sadly, I just look at it as another item that has to be washed after the meal is over. 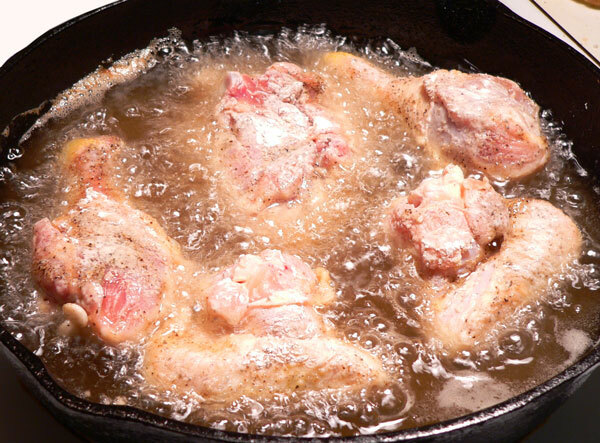 If you take just a pinch of flour, and drop it in the hot Lard, it will start to dance and sizzle if the Lard is hot enough to start frying the chicken in. As you can see here, it just wasn’t quite hot enough at this point. A thermometer would be even better if you have that. 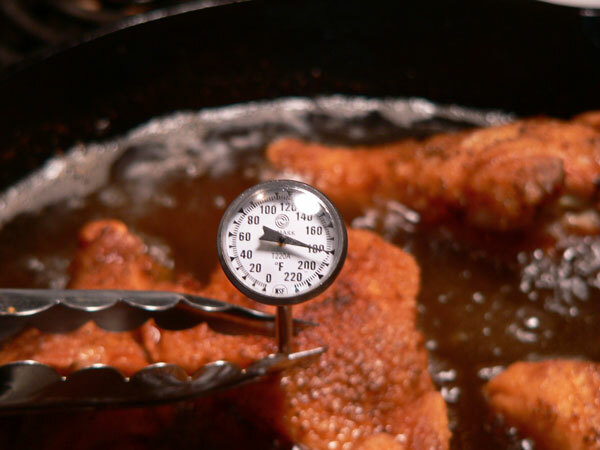 The Lard needs to get up to 350º to properly fry the chicken. I’ve learned that placing my largest burner on just a little below Medium heat, works perfect for frying. With a little practice, you’ll learn what works best for you. Place the chicken, skin side down, in the skillet. That grease is hot, be careful lowering the chicken so it doesn’t splatter back on you. Don’t overcrowd the pan when adding the other pieces. I’m cooking wings, thigh and legs in the first batch. The breasts will cook a little quicker, so I’ll add them in the second batch. I like to call the next steps, the 8-8-8-8 Method. I’ve just found it to be an easy way to remember the steps involved. We’re going to fry the chicken 8 minutes with the lid ON, then 8 minutes with the lid OFF. From now on, you’ll always remember the 8-8-8-8’s. Take a look. Cover the chicken. I’m using a lid from one of my canning pots. It fits almost perfect on my cast iron skillet. We’ll start timing the process once the lid is on. We want to cook the chicken for 8 minutes with the lid on the frying pan. After 8 minutes with the pan covered, you’ll need to carefully remove the lid. It’s going to be hot and have steam escaping when you lift it, so be careful. I use my tongs to remove the lid and sit it aside until needed again. Uncover the chicken and let it cook for 8 more minutes. Use some tongs and turn each piece. Tongs are better, so you don’t pierce the chicken like you would if you flipped it with a fork. You could also re-position the pieces in the pan if you see one area is cooking a bit hotter than the other. You’d know this by seeing burned spots. Place the lid back on the chicken once again. We’ll let it cook for 8 more minutes on the second side with the lid on the pan. Carefully remove the lid once again. The chicken has cooked pretty well on both sides by now. It will need to cook for about another 8 minutes with the lid off again. At this point, you could use a meat thermometer to see what the internal temperature of the chicken is. It needs to cook until that temperature reaches 160ºF to be best, so it might not actually take a full 8 minutes during the last stage. It just depends on how hot your pan is at this point. I let the chicken fry for another 8 minutes and tested the temperature. It had reached just above 180º in one of the thigh pieces. The internal temperature was a bit higher than is needed to be considered fully cooked and safe. If you cook the breast pieces to this temperature, they’re apt to be dry and tough. 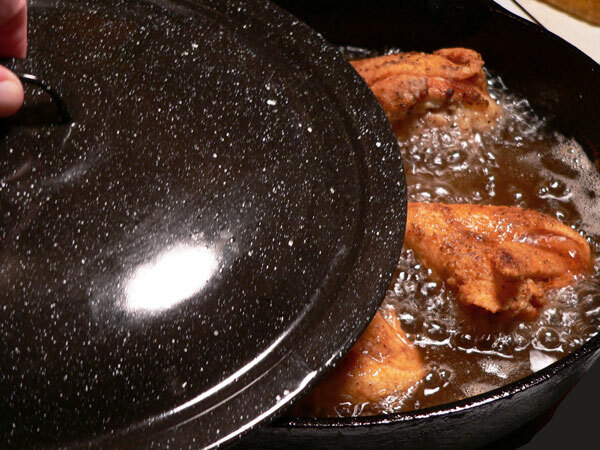 In order to keep the fried chicken good and crispy, remove it from the pan and let it drain on a piece of brown paper bag, or on a wire rack. It’s best to not place it on paper towels unless you like a softer touch to the skin. Experiment with it and find which you like best. 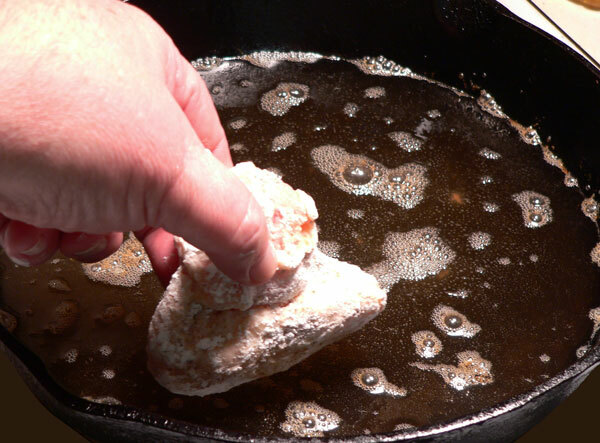 Placing the fried chicken in a bowl and covering with a towel will soften up the exterior, but still give a tender and moist fried chicken experience. Go ahead and cook the second batch. Since we saved the breast pieces until last, they will cook a bit faster. I still used the 8 minutes with the lid on, 8 minutes with the lid off – then turn, and cover and cook about 8 more minutes. When you remove the lid, check the internal temperature of the breast pieces. It will probably be done and should be removed. Thicker pieces of course will take longer to cook than the thinner sections. You’ll just have to monitor it during the final minutes of cooking so as to not over cook it. It takes a little practice, but you can do it. Pan fried chicken is best if allowed to cool for about 15 minutes before serving. You don’t want anyone biting into super hot pieces of chicken. 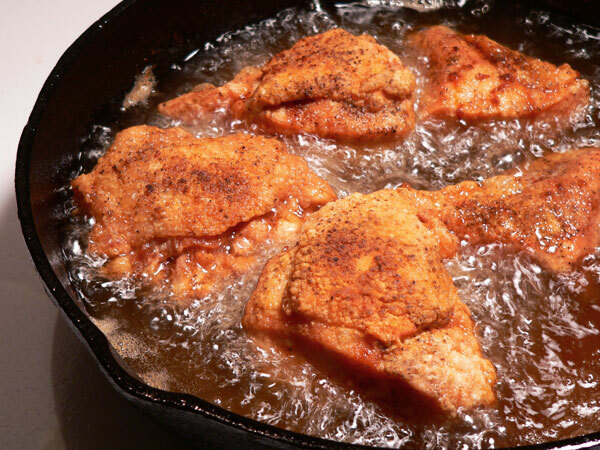 Follow step-by-step, photo illustrated instructions for making our Southern Fried Chicken in a cast iron skillet, just like mama used to do it. I’ll even share our families secret recipe of “herbs and spices,” so you can make this delicious old southern classic at home for you and your family to enjoy. Lard or shortening, for frying. 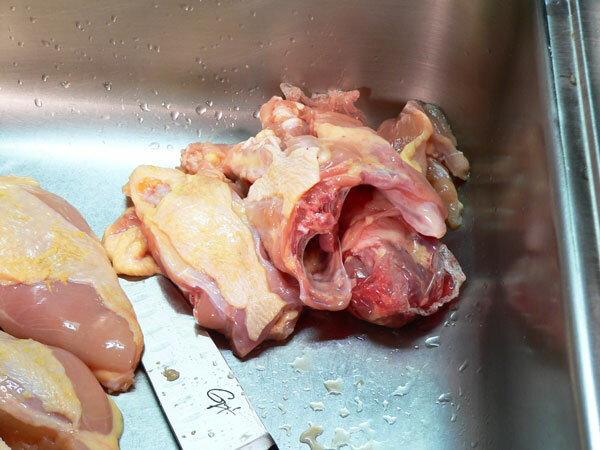 Remove neck and giblet pieces from inside chicken cavity. Set aside. 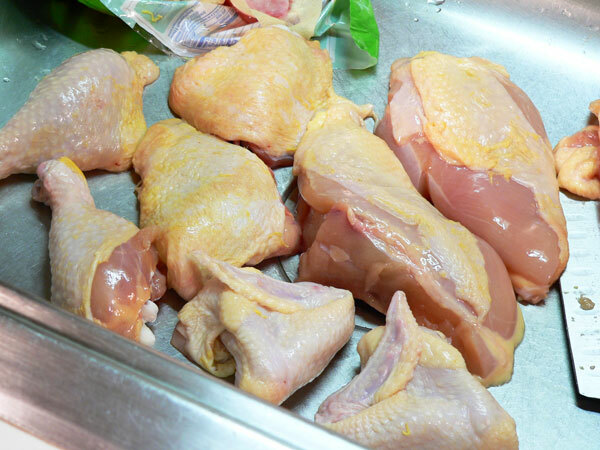 Rinse chicken, inside and out, under cold running water. Carefully cut up the chicken into 8 pieces, reserving backbone for stock. Spread chicken pieces out on a sheet pan. Sprinkle both sides with Salt and Pepper to taste. Place about 2 cups of flour in a mixing bowl. 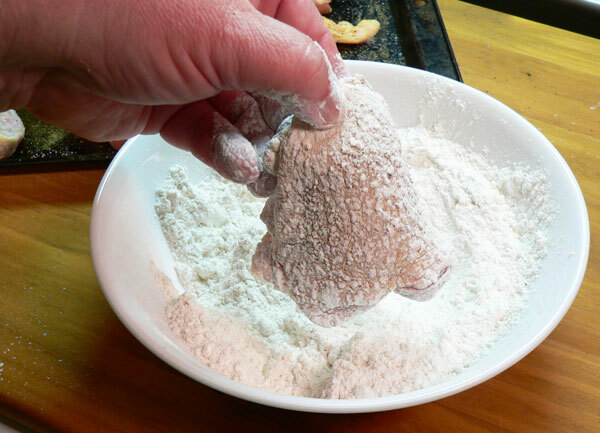 One at a time, dredge the chicken pieces in the flour, coating both sides and ends. 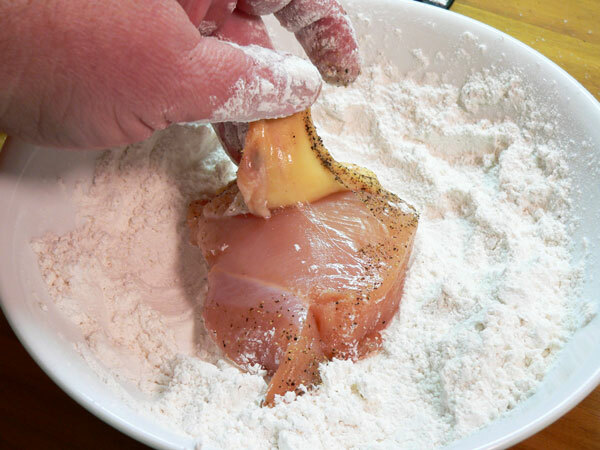 Remove chicken, shaking off any excess flour. Set the coated chicken back on the sheet pan. Let it rest while you heat up the Lard. 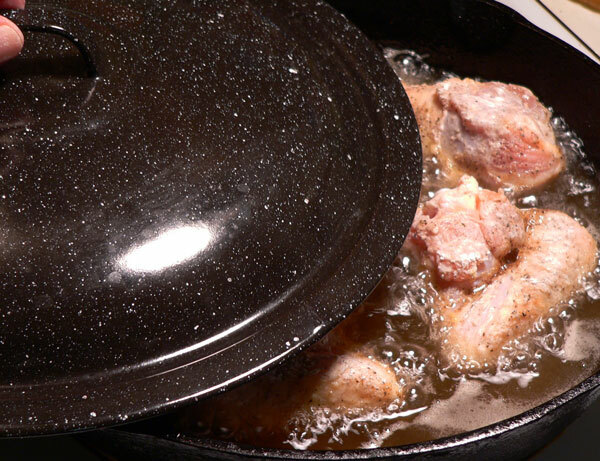 Heat the lard in a cast iron skillet to 350º for frying. 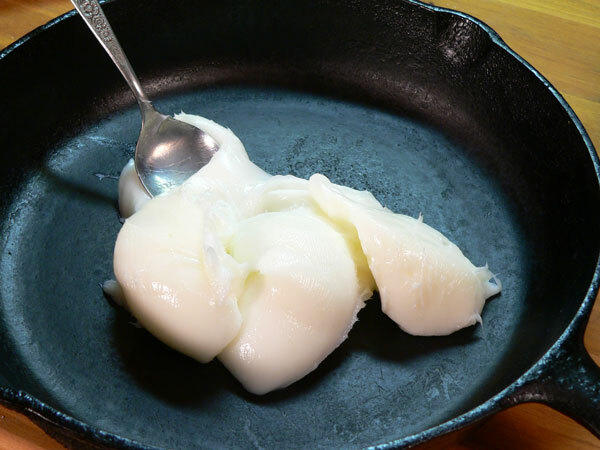 Melted lard should be about ¾ of an inch deep inside the skillet. 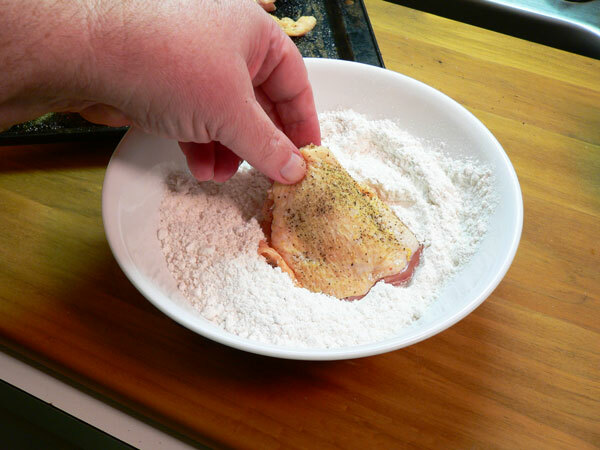 Carefully place pieces of floured chicken in the hot oil, skin side down. Do not overcrowd the skillet. Cover and let the chicken cook for 8 minutes. Remove cover and let chicken cook for 8 minutes. Carefully turn chicken over, cover the pan and let the chicken cook 8 minutes. 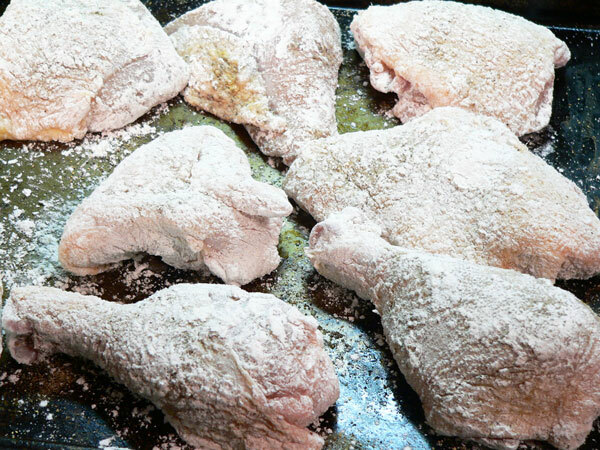 Remove cover and let chicken cook 8 minutes longer, turning as needed to cook edges. 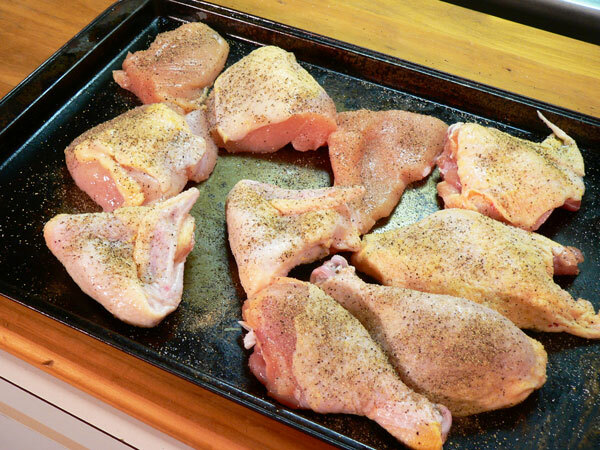 Remove chicken from skillet and place on wire rack or brown paper bag to cool. Let the chicken cool for 15 minutes before serving. Your Comments: Do you fry chicken at home? Think its just easier to buy it already fried? I’d love to hear your comments on our recipe if you decide to give it a try. 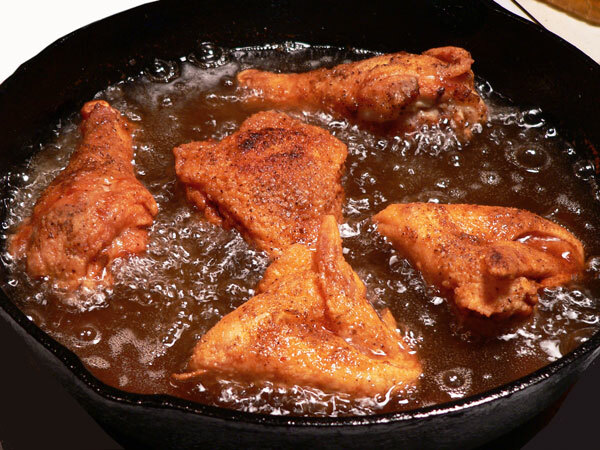 Maybe you have fond memories of a parent or grandparent frying up some delicious chicken at your home. Feel free to share your story in the Comments Section below. It will only take a minute or two and I’d love to hear from you. Just know that all of our comments are moderated. Basically, that just means that I read each and every one of them before they are approved for our family friendly home here on the Internet. I also try to reply to as many comments as possible. It may take me a day or two, but be sure to check back for a reply. Thank you in advance. Sign Up For Our FREE Newsletter: While you’re here, be sure to signup for our Free Newsletter. I try to send out a quick note each time we add a new recipe, or anytime anything of interest is going on around Taste of Southern. It will only take a minute to subscribe, and should you ever decide you’re no longer interested, it’s even easier to Unsubscribe. Just enter your Email information in the box below, or in the one you’ll find in the top right hand corner of each page. I’ll look forward to seeing your name on the list. I’d greatly appreciate it if you’d share our information with your family and friends as well. Thanks once again. Just one quick question. 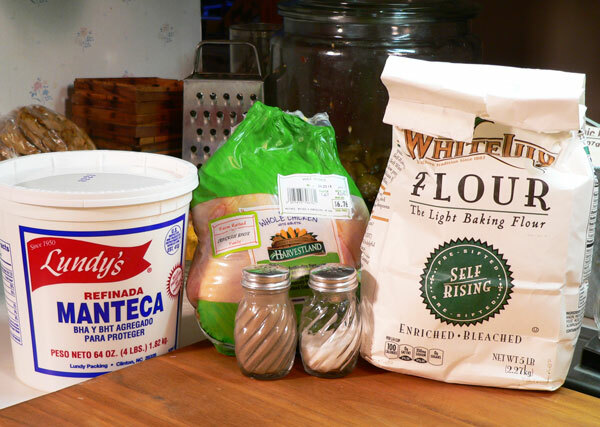 You have self-rising flour pictured, is that what you use? I agree you can’t beat Southern Fried Chicken like Mama made, and if you get it perfect I’ll be the first to try it. But you know what, Mama cooked with such an extra helping of love in the skillet. At my fragile 79 yo, I can no longer lift cast iron but I have a skillet with vented cover which is just begging to try your southern fried. I’ve also got ten nice thighs that have been skinned, most fat removed, pounded, split them at the bone – too weak to pull the bone out for boneless- individually pkg’d and frzn. I’m really looking fwd to trying your method on a couple. . You’re also correct our chicken had not been raised on anything special – just yard, chicken feed that had NO additives and on occasion a 25# bag of oyster shells for the eggs. Haven’t fried chicken in so long I had to go online to refresh memory and came across you website. Thanks loads. Home grown chickens are the best, I totally agree. Organic store bought is next. Avoid the major grocery stores, icky. When I was a kid, the chickens were killed after church (very rarely the night before), cooked for dinner that night. Sunday was always chicken dinner. My grandmother soaked the chicken in saltwater (gets all the blood out, makes for white meat), fry in butter, lard if we didn’t have enough butter-rare cause Nubbins (the cow) gave lots of great milk. Finally I tried your chicken recipe. Did not have lard (do not know where to find it) only shortening. The apartment has an electric stove and it was tricky adjusting the temperature. Used the microwave timer to keep track of the process. A few years ago I bought a cast iron chicken fryer with a lid, now I know why they have lids. The inside of the lid has little pimples, I think it is for the steam to drop and keep the chicken moist. Do you know why? My chicken came out a bit dry and overcooked. Your method works wonderful. Will have to do some adjustments for the next time. Thank you! I do the same recipe, except I fry it for the 8 minutes or so until the crust is golden brown. Then put the chicken on a rack with catchpan underneath and bake at 350F for 15-20 minutes. Much of the grease drips out and the crust is very crunchy. BTW, lard is where it’s at. Better flavor and better for you (ducking from food police). Hope you have a wonderful Thanksgiving. Since you are so fond of seafood I am sending you a very old family recipe from my days in Charleston South Carolina. Mix together. Add water to cover. Boil for 5 minutes. Fill a pot with water. Add vinegar, salt, pepper, mustard powder, bay leaf, onion, garlic and hot sauce. Bring to a boil and add sausage, corn and potatoes. Simmer for about 30 minutes or until done. Add shrimp and simmer for 5 minutes. Drain and discard onion and garlic. Serve in a large bowl. Makes 4 servings. Thank you so much for posting the instructions. Love your stories especially Dirty Harry:) This year I will have to perfect my fried chicken; I will be working with your recipe. The problem with my fried chicken is the inside is never fully cooked and the outside is done; I always have to finish it in the oven. I will also be working with your biscuit recipe; mine are hockey pucks. LOL! Reading this post, I felt like you were describing my Granny’s Sunday dinner…right down to covering the table with a big ole cloth after dinner was over. 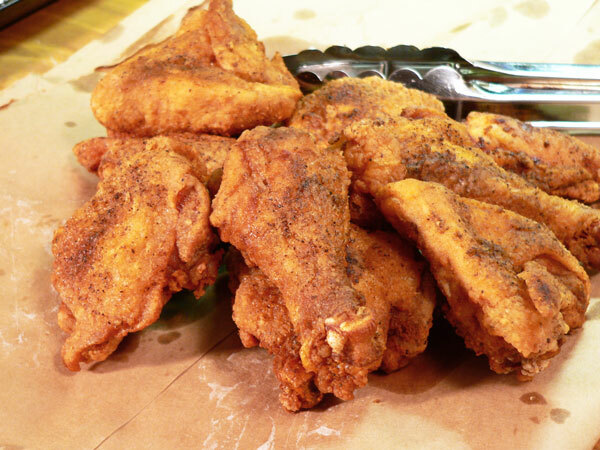 I have looked and looked for a recipe for this kind of fried chicken. I have a chicken that an old lady gave me…raised, killed, and cut up herself. I am hoping to do it justice with this recipe. Wish me luck! Have you ever tried rendering your own lard? There’s a HUGE flavor difference IMHO and all you need is a good butcher to get you some leaf fat from the pig, a crockpot, knife, and cutting board. Maybe a strainer. There’s a million videos on YouTube showing how to do it. My favorite video on the subject is on Michigan Snow Poney’s channel. Maybe it’ll get you a teensy bit closer to your Mama’s fried chicken. Good luck and God bless! Steve, I suspect your Mama cooked with her ear, not a clock and a thermometer. Her chicken probably never saw 170°. You may want to try listening to chicken frying. It will tell you when it’s done and time to take it out. A chicken that tastes like a chicken sure helps and after that it’s all technique. Hi Hilditch, You’re right about Mama not using a clock, or a thermometer. She just looked and listened, and fried up some great chicken. I don’t often fry chicken here at home, so I’m not as experienced with the listening part as she would have been. We fried fish and shrimp that way at the restaurant. The more you do it, the better you generally get at it, or should. Love this recipe, my drum sticks turned out a bit black after the flip even after removing them early! I’m sure it had to do with using a copper bottomed instead of cast iron skillet but I’ll surely be attempting it again once I invest in a lodge logic pan, thanks! Thank you very much for demonstrating that you do not need modern tools to formulate good dishes, these are GREAT! Will be looking at your entire site. You will hear from me again!!!!! Hi Steve, your fried chicken recipe inspired me to get lard from the farmers market and cook with it for the first time ever. The chicken was great! A question: my mother soaked the chicken in buttermilk for a few hours prior to frying, though I do not know the reason and she is no longer around for me to ask…its entirely possible that she was taught to do this and had not known why. Is that just an unnecessary step or might it be worthwhile? Thank you so much for the wonderful pictures (love step by step pictures and yours were awesome) and detailed tips…it was especially helpful for my first foray into cooking with lard! Hi Barbara, I’m thankful you found Taste of Southern, and that you purchased some lard to fry up a batch of Southern Fried Chicken. It’s good to know that you liked it. Lots of folks marinate chicken in buttermilk before frying. And, you’re right, a lot of them do it because that’s the way they were taught to do it. Mama never did, thus I don’t. However, soaking in buttermilk can serve a couple of purposes that you might want to try. The bit of acid in buttermilk can help tenderize the chicken a bit. Not much, but maybe a little. It will also add a bit of flavor to the chicken. By all means give it a try the next time you fry some chicken. You might like the results. I hope this helps. Thank you so much for this recipe. We raise and process about 35 chickens twice a year for our family and give away a few as gifts. We can’t go back to store chicken after enjoying our own pasture raised broilers! It’s definitely worth the effort. I just rendered pastured pork lard for the first time and I’m so excited to try your recipe! I can’t wait to explore your site for more recipes and instructions. I’m hoping I will finally be able to make a decent biscuit! Hi Sarah, I’m thankful you found Taste of Southern, thank you for your comments. Must be nice to be able to raise your own chickens. I might be a bit envious of that. I understand there really is a difference in the taste as compared to what most of us get from the grocery store. How did that lard turn out? Im 50 now.. Your mom was about the same age as my mom.. I grew up on a farm.. Old school.. 7 kids 2 parents.. I LOVE your old recipes of cathead buttermilk biscuits, fried chicken,pork chops etc.. Mashed taters and gravy went with any iron skllet fried meats.. And any kind of beans.. I use your Taste of Southern site alot to teach my kids primetive farm living and simple cooked meals for large families back in the day/. Seamed like Mom could cook a full course fried up meal in minutes..
As I’m reading this recipe, I’m thinking what about the second coating of flour, and where’s the egg? My mom made the Best Fried Chicken, and we even used a deep fryer at my house. The result was Wonderful. It was like your chicken fried steak recipe. I was just looking at your “Chicken Fried Steak” recipe. Just a thought. I have to say, using a deep fryer is a great way to fry as you will not have so much oil in your food. Always place on the paper towels to drain after frying. Greetings, Steve! I have been exploring your website and I decided to try this recipe last night. Overall, I enjoyed the results and it was the best effort I’ve made with fried chicken in quite a while. I didn’t have any lard, so I used peanut oil, which didn’t give me quite the richness I was looking for, but turned out pretty tasty nonetheless. Crispy and fairly light on the grease. I like to render my own lard, and I should have some fat coming my way soon. Once that’s in place, I will surely make this again and continue to use your 8’s technique, which I think was the greatest factor in my success. The one modification I’ll make to it is to turn my chicken a bit more frequently, as I got a burned spot where one of the pieces rested for too long. Like you spoke of, it can take a little adjustment depending on many factors. I’m really getting a kick out of all your recipes and lovely stories, so please feel encouraged to keep up the good work. As for me, your biscuits are next! My best to you. Hi Rebekah, I’m thankful you’ve found Taste of Southern, and very happy to know that you were willing to give our Southern Fried Chicken recipe a try. Lard really makes a difference in my opinion. It’s difficult to find the good stuff in stores these days as it’s all pasteurized etc. Rendering takes a little time, but well worth the effort. I commend you for doing the extra work. 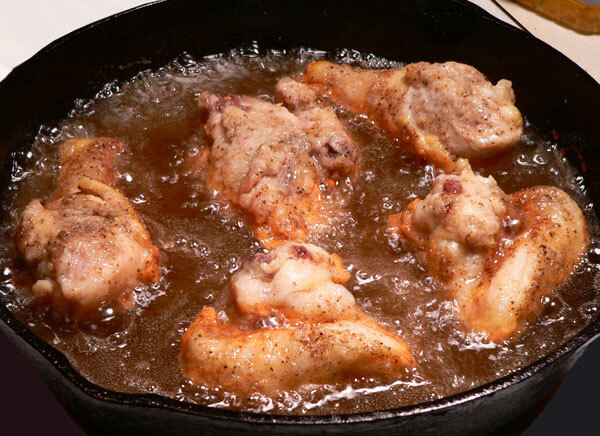 Instead of turning the chicken more often, might I suggest that you either rotate it around in the pan, or just turn the whole skillet around if possible. That helps prevent some of the hotter spots from burning the chicken. Just a suggestion of course. Excellent recipe Steve! Thanks for sharing! One quick question: what’s your assessment with substituting lard with something else, like canola or peanut oil? Just wanted your opinion. Thanks! This is the same recipe that has been handed down in my family for generations. My paternal Grandmother was a hard working Iowa farm woman..before all of the modern conveniences of modern farms. She raised 100’s of chickens while my Dad & Grandfather tended the hundreds of acres of corn. Store bought chickens today do not taste the same as those farm raised chickens, makes a huge difference. I don’t buy store chickens. Thank you for this post. I have always wanted to try cooking with lard and after seeing this recipe I am definitly going to try it. I liked that your recipe does’nt have to many ingredients and that you gave the amount of time it should take to fry it. Thank you again.